El Pósito is a large manor house that hosted as a silo the surplus cereal grains that were stored for distribution in times of famine. Restored for tourist accommodation without having lost authenticity, decorated with simplicity and equipped with everything you need to enjoy a quiet place in the countryside. It is distributed on two floors in such a way that the kitchen-dining room is kept within a common space, recovering the rustic air in a more modern practical sense. The walls have been left clean, simply whitewashed, so the dark woodwork of the windows and the large agate door at the entrance next to the floors and the ceilings constitute a set of a strong two-tone contrast. In addition to the aforementioned, on the upper floor there is a large living room, very comfortable, simple and attractive, where the antique furniture combines harmoniously with the functionality of the living room. On the lower floor there are two large bedrooms, one with a double bed and another double with extra beds of the same size and with their corresponding bathrooms; both have direct access to the garden surrounding the house. 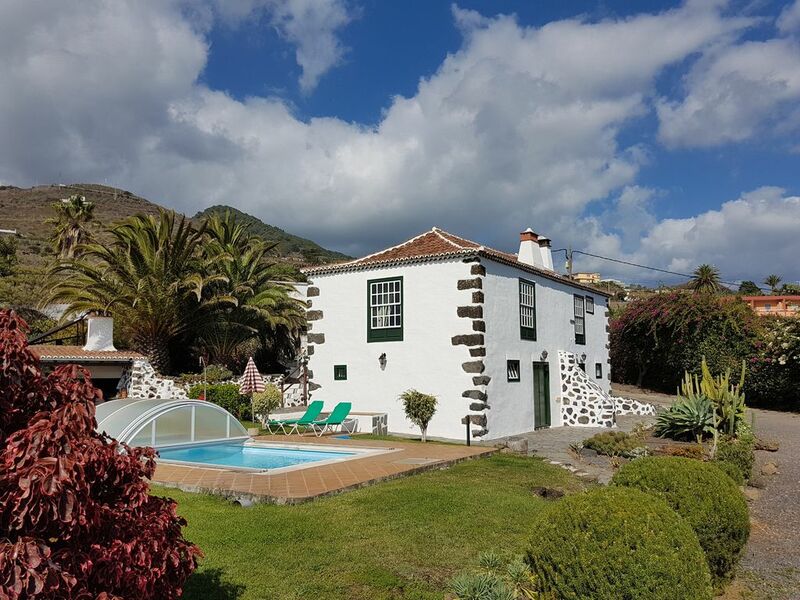 The tranquility that is breathed in the area invites to walk around the gardens and vineyards and the pleasant environment offers the possibility of a good swim in the pool or sunbathing in the patio or enjoy pleasant meals outdoors in the barbecue. The house has been accredited with the "Q" of quality granted by the institute for the Spanish tourist quality in 2003 and renewed in 2005, 2008 ...... 2012 with its corresponding follow-up reviews every year, and which guarantees optimal conditions of the establishment. The responsible tourism institute certifies that this establishment has been evaluated and meets the requirements of the rural house standard of the biosphere since December 2006.